Of all the units to serve in World War 11 one of the strangest and arguably the bravest was the very top secret, highly trained 'Z Special Unit'. More commonly but also incorrectly referred to as 'Z Force', in fact these were two entirely different units. All of its missions were cloaked in ultimate secrecy and even though it's been over 50 years since the end of World War II very little is known of its 182 missions. Z Special Unit recruited men from many branches of the Armed Forces and as well as being most secret it was probably the most 'multi-cultural'. Although most of its members were Australian, there were also British, New Zealanders, Dutch, French, Malays, Canadians, Americans, Indonesians and Chinese - All experts in various subjects to do with clandestine operations. Of all the missions undertaken by 'Z Special Unit' the most spectacular and well known were the two raids carried out against enemy shipping in Japanese Occupied Singapore Harbour. The first of these, Operation 'Jaywick', 26th September 1943 resulted in 38,000 Tons of enemy shipping sunk. 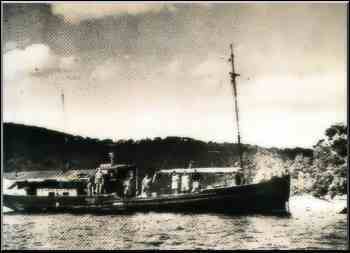 The second - Operation 'Rimau', 11th September 1944 involved the use of small one man submarines. They were compromised before arriving at their destination which resulted in the capture of the raiders and consequently their 'ceremonial' execution (beheading) by the Japanese. Operation Jaywick - a seemingly suicidal plot to destroy Japanese shipping in Singapore Harbour was one of the most daring raids of World War Two. In September 1943, ten Australian and four British servicemen struck at the heart of the Japanese supply line to New Guinea. Krait just prior to leaving for Operation Jaywick - At Refuge Bay, NSW. The heroes of 'Jaywick' travelled 5,000 Miles through enemy infested waters in HMAS Krait, a small fishing boat, to blow Japanese shipping, confidence and moral to pieces. This is the story of the guts and determination of our Diggers and Sailors striking an incredible blow in the bitter struggle against the Japanese. The Operation was planned by Australian and British Commando and Intelligence Officers and was to take place at the same time when the Salamaua, Lae and Finschafen operations were taking place against the Japanese in New Guinea. Disorganisation of Japanese shipping was deemed to be an essential factor in the success of these operations. So great was the secrecy of Operation Jaywick that Major Bob Page of Grafton, New South Wales, died in a later operation without even knowing he had been decorated for his part in it. For nine months the party trained at a secret camp on the Queensland coast. The vessel assigned to them was the 'Krait', a former Japanese fishing boat, 70 feet long, 11 foot Beam with a range of 11,000 miles and a top speed of 6.5 knots. Krait had originally been sailed to India from Singapore, after its fall to the Japanese, where she was commandeered by Military Intelligence for 'possible future use'. Later, she was sent on a perilous voyage across the Indian Ocean to Australia and refitted for her new role. Krait departed Exmouth in Western Australia laden with weapons, limpet mines and rubber canoes, which were stowed out of sight, and headed north toward the Lombok Strait in the very dangerous occupied waters around Surabaja, Indonesia. She was sailed to within 21 miles of the 'Singapore Roads' and then the canoes were loaded with rations and water for one week plus operational stores and weapons. The canoe borne raiders arranged their rendezvous with Krait for the night of October 1st at Pompong, 28 miles from the advanced operational post, for which Dongas, eight miles from Singapore Harbour had been selected. At 8:30 on September 22, the three canoes, with their six raiders a piece reached Dongas. The arduous nature of the long paddle necessitated a day of rest for the canoeists and the next day Singapore Harbour was reconnoitered for likely targets. At no time during their five day observation was there less than 100,000 tons of shipping present in the harbour. On September 24 the three canoes attempted infiltration of the harbour but adverse tides forced abandonment of the mission. All during this period the raiders were under the constant threat of being detected by the numerous and active Japanese water and shore patrols. The next night the base of operations was altered to Palau Sambu where the tides were more favourable and on the night of 26 September the successful raid was launched. Canoe 1 reached a 10,000 ton tanker and two limpet mines were attached to her hull, one at the place of the engineroom and another on her propeller shaft. Canoe 2 twice crossed the boom of the harbour in search of worthy targets and finally selected three of the most tempting - one 5,000 ton freighter, the 6,000 ton 'Taisyo Maru' and another 5,000 ton tanker. Canoe 3 covertly examined ships and sentries along the lighted wharves before selecting the modern freighters 'Nasusan Maru' and 'Yamataga Maru'. The attacks began soon after 8:00 pm. At dawn, the canoes were back at their operations base camp and there the crews settled back to watch the forthcoming show. Seven separate explosions were heard between 5:15 am and 5:50 am and both sea and air patrols were observed setting out searching for the attackers. At dusk on 27 September the raiders set out for their rendezvous with Krait which was cruising in the vicinity of Pompong Island and despite the frantic and exhaustive air and sea searches by the enraged Japanese the canoeists slipped through the net and made their rendezvous . 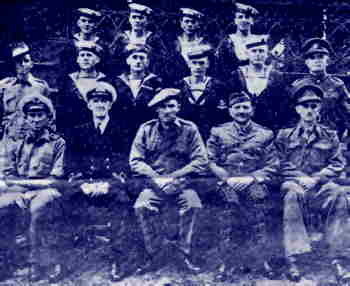 Lieutenant Carse and the seven member crew of Krait had been waiting and playing cat and mouse with Japanese patrols for 16 anxious days when all of the raiders were picked up safely. The Krait then stole away unnoticed bound for Australia where there were one or two close calls along the way - such as being interrogated by an inquisitive enemy destroyer, but she reached Australia without the loss of a single man (a remarkable achievement for such a hazardous mission). The seemingly impossible 'Operation Jaywick' had been a resounding success. It was not at all surprising that Krait was taken for a Japanese fishing boat for, in fact, that was exactly what she was. This robust little vessel with its 24 metre long, teak plank, copper-sheathed hull had begun its life as the Kofuku Maru. Before WWII she operated from Singapore in the abundant fishing grounds off the Malay and Dutch East Indies Coast. When the war in the Pacific broke out in late 1941 the Kofuku Maru was seized by the British Government in Singapore and interned. A few weeks before the colony was occupied by the rapidly advancing Japanese Army early in 1942 command of the vessel was bestowed upon Bill Reynolds, an Australian who had lived in Malaya and new the local waters extremely well. Reynolds sailed the Kofuku Maru to the Rhio Archipelago, where she was put to work as a ferry to evacuate the hordes of refugees fleeing before the Japanese down the Malay Peninsular. As well as a human ferry she also acted as a guide ship for all the smaller boats trying to cross the Straits of Malacca. The Kofuku Maru was more than likely the only Japanese vessel to be commanded by an Australian during WWII. She carried out her duties well and under the very noses of the advancing Japanese. Finally it was time for Bill and his new vessel to flee also. Strafed by Japanese fighters she ran the gauntlet of the Malacca Straits and disappeared into the vast Indian Ocean. At last the Australian owned Japanese fishing boat made it to Ceylon, a little battered but still sea worthy. From there she was sent on to Bombay, India. A name change was now in order so whilst at Bombay she was given a new name which would forever become part of Australian Naval history - Krait. Krait is the name of a tiny but extremely deadly venomous snake found on the Indian subcontinent. It would become very appropriate, for like the reptile she was named after; Krait was able to strike swiftly and surely before her victim realized she was there. At this point of time in India a plan to hit back at the all conquering Japanese was being hatched. This plan included striking at Japanese shipping at the now occupied island of Singapore. Being Japanese built and of a type very common in the waters around the former British Colony, krait seemed the perfect choice to infiltrate enemy lines. the best starting point for such an operation was Australia for the approaches to Singapore via Ceylon or India were heavily patrolled by the Japanese. So it was that bill Reynolds was ordered to sail Krait on the long and dangerous journey across the indian Ocean to Fremantle in Western Australia. After the Singapore raid Krait was sent to Darwin to join the Lugger Maintenance Patrol of the famous Z Special Unit. At the end of WWII she was taken over by the occupation authorities at Labuan Island off British North Borneo and sold to a local trading company which for the next twenty years used her to haul timber down the jungle rivers of Borneo. In 1963 The Krait Committee was formed in Sydney with the aim of bringing her back to Australia for permanent preservation. The money was raised with the aid of newspaper appeals and the like and also as I was a sailor during that time we received letters onboard from the committee asking the Ship's Company's of RAN warships to donate to the fund. So it was that in march 1964 a rather battered Krait arrived in Brisbane aboard the P&O ship Nellore. 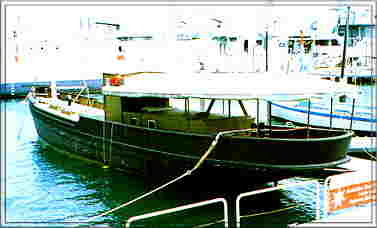 On ANZAC Day 1964 Krait sailed proudly into Sydney Harbour, to be escorted down Port Jackson by an armada of small craft. Received by the State Governor at historic Farm Cove she was dedicated as a floating war memorial, then presented to the Volunteer Coastal Patrol to use in training and rescue work. She now resides peacefully at the National Maritime Museum in Darling Harbour, Sydney (below). The brave little fishing boat is now home to stay.